It wasn’t his reaction when he first learned of the 9/11 terror attacks but his lack of one that sparked a flurry of accusations and criticism. But George W. Bush has finally given an explanation as to why he seemed to have no response when initially told about one of the greatest tragedies in American history – he was trying to project a sense of calm. 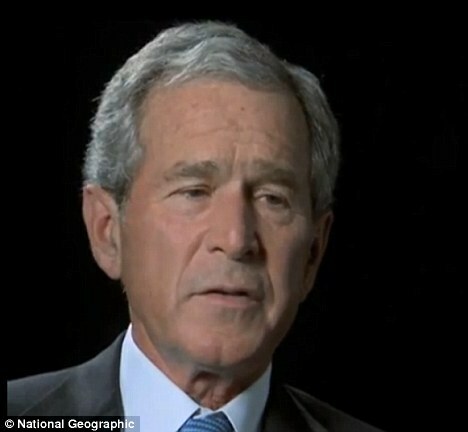 In a rare interview about the attacks, the former president told the National Geographic Channel what was going through his mind when he was informed that a second passenger jet had hit New York’s World Trade Center. 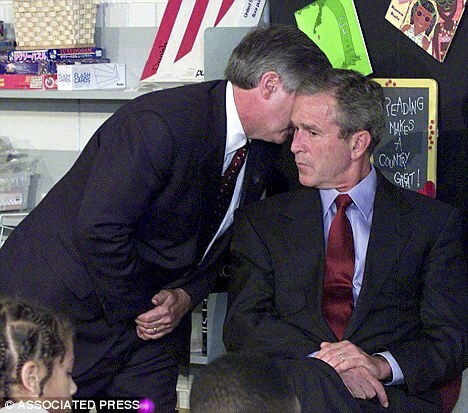 Bush was sitting with a group of children who were reading aloud when he said he saw reporters at the back of the room getting the news on their cellphones, which he described as like ‘watching a silent movie’. ‘So I made the decision not to jump up immediately and leave the classroom. I didn’t want to rattle the kids. I wanted to project a sense of calm,’ he said. He said: ‘From the air it looked like a giant scar. But when I actually got to the site, it was like walking into hell. Hearing from the former first lady, Mr Bush said, ‘was awesome to hear her voice. And she had talked to the girls. And they were secure’. The programme will also feature archival footage, shot at the Pentagon and in New York days after the attacks, from the George W. Bush Presidential Library, which has never been featured publicly before. Until now, the former president has never discussed on camera what he was thinking and feeling, and what drove his real-time, life-or-death decisions in the first minutes, hours and days after the attacks. It is also the first time the former President has discussed the death of bin Laden. Peter Schnall, producer and director, said of the interview: ‘There were no politics, no agenda as he recalled what happened that day. What you hear is the personal story of a man who also happened to be our president. ‘Listening to him describe how he grappled with a sense of anger and frustration coupled with his personal mandate to lead our country through this devastating attack was incredibly powerful. ‘What surprised me most was his willingness to speak openly, candidly and personally about the events of that day. Mr Bush reflects on the historical implications of the anniversary. The interview will premiere in the UK on Tuesday September 6 at 9pm.